This entry was posted on August 17, 2013 at 9:05 am and is filed under current fashion. You can subscribe via RSS 2.0 feed to this post's comments. Both comments and pings are currently closed. I have sometimes done wide curved hems in a different way. 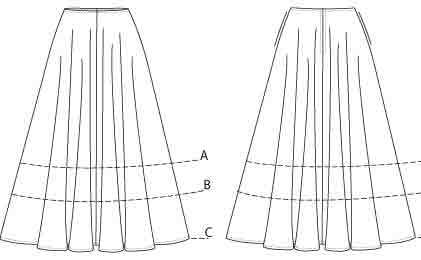 If you have enough fabric, cut the hem as a separate facing, sew to the skirt bottom and then hemming is easy because it “fits” the curve and there is no gathering or pleating in necessary. Thanks Vildy, that’s a very helpful tip. I can see myself wearing a balloon-skirted shortish tunic (mid-thigh length) over leggings even though I am fat, because I have good knees and lower legs and like to emphasize my cool shoes. I find skirts really hard to sew; I want good sturdy pockets and I haven’t mastered getting the darts and waist right due to my fat tummy, high hips, and yet I do have a waist in between my hips and ribs. 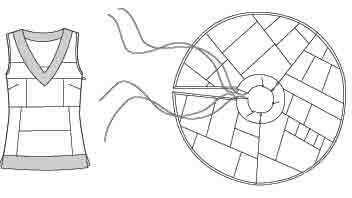 Yes agreed – I had to do a lot of trying out darts on a muslin, not quick but it’s quite good now. 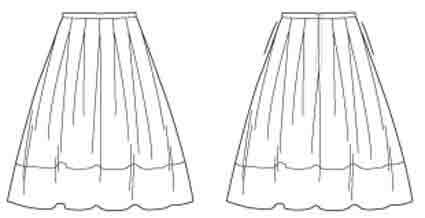 I love skirts but always find it hard to think about what to wear with them, shirts T’s jackets etc. Summer is ok as a Tshirt usually looks ok but it is the winter look that I need some styling advice in!!! Jacqui – this depends so much on personal body shape, and how much ease you like. Some styling books talk about this, but they don’t cover all the possible combinations. – what length of top, etc. How well do the proportions and style elements of the top balance the skirt ? As you like Ts, perhaps you prefer a close fitted look in wovens too.